Image is one of the UserForm control. You can select and drag Image on the UserForm. You can select and drag Image on the UserForm. Image control embeds a picture such as a jpg, jpeg, gif, png, bitmap, etc. It can be used on the UserForm. You can see how it works and more details about Image Control. 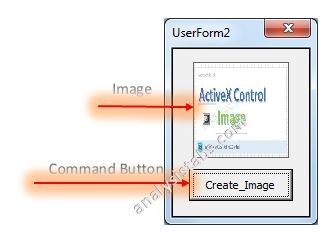 Please find more details about VBA ActiveX Image_Control on the UserForm. Drag the Image_control on the Userform from the Toolbox. Please find the screenshot for the same. Click on the image_control properties. On the left side find ‘Picture’ from the available properties of the control. On the right side click on that, and select image from the source. On the left side find ‘PictureSizeMode’ from the available properties of the control. On the right side, select ‘1 – frmPictureSiseModeStretch’ from the available list. Now, Click ‘F5’ to see the output. Now, you can see the following output as shown below in the screen shot. Please find the following steps and example code, it will show you how to add dynamic Image_control on the userform. Add Image and CommandButton on the userform from the toolbox. Call the below procedure named ‘Add_Dynamic_Image ’ and find the below procedure to run. Now, click F5 to run the macro, click ‘Create_Image ’ button to see the result. You can see the created dynamic Image_control which is shown in the following screen shot. 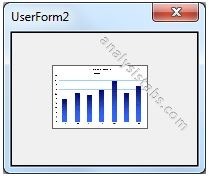 Please find the below code, it will show you how to delete or remove the control on the UserForm. 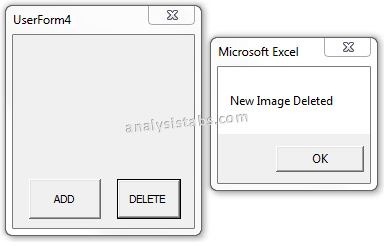 In the below example, its deleting the Image named ‘New Image’ which is on the UserForm named ‘UserForm4’. We can use Remove method to delete the controls which are created during run time. Controls which are created during design time cannot be deleted using this method. Please find the below example and screen shots for better understand. 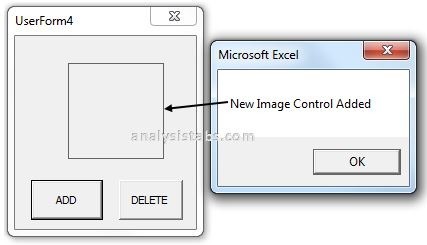 MsgBox "New Image Control Added"
Code 1: Deleting or Removing Image_control which is created during run time.